Skincare tips for acne-prone skin can help you keep your complexion clear. According to NIAMS (National Institute or Arthritis and Muscoskeletal and Skin Diseases), 80 percent of people between the ages of 11 and 30 suffer from acne, so you're not alone if you're looking for tips on how to treat this condition. Scrubbing your face will not improve your complexion. In fact, excessively rubbing, squeezing, or picking at your skin only makes acne worse so resist the urge to pop, squeeze or burst pustules. This can lead to scarring. A good skin regimen and the right products can help acne-prone skine. Oily skin may contribute to acne but it isn't necessarily the cause. Many people believe clearing up skin means drying it out with harsh exfoliants and chemicals. This is not the answer, however. Avoid harsh skin care products and opt for gentle or hypoallergenic products. Avoid plain soap because it is easily trapped beneath the skin's surface and can cause acne. Try gel-based cleansers with light exfoliants. Treat acne with a skin care regimen consisting of several different products. For example, you may use a cleanser to remove dead skin cells and an anti-acne gel to control excess sebum production while fighting bacteria. There are also acne treatment masks that can be used on a semi-regular basis to open pores and clear debris. Apply acne treatment products to freshly cleaned skin. Wash your hands before applying treatments to your skin. Place the product directly on the bump. Applying the treatment to your entire face will cause uncomfortable dryness. Wash your hair daily and after sweating excessively. Washing away bad oils frequently reduces acne breakouts. Switch to oil-free skin care products. Skip abrasive products such as microdermabrasion or exfoliating cleansers. When you're shopping for acne treatment products, look for medications that have been dermatologist-approved. These products are less likely to cause irritation, flakiness, or redness in your problem skin. Patience is a key component of acne skincare. Generally, it takes at least two weeks to see results from an acne treatment product. In most cases, significant improvement requires several months of regular use. Don't give up your skincare regimen until you've given the products a chance to work. You many want to ask for a prescription to treat your acne from the inside out as well. A doctor may prescribe a medication such as Isotretinion. If you experience depression with your acne, tell your doctor. Depression related to acne is not uncommon among teens and adults. Did you know Americans spend more than $100 million yearly on over-the-counter acne skin care medications? Clearly, acne sufferers have a wide array of choices to treat their condition. However, there are two just common ingredients found in most nonprescription acne skin care products: benzoyl peroxide and salicylic acid. 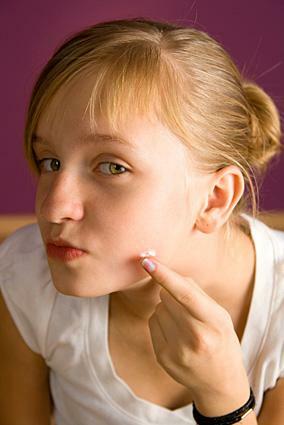 Benzoyl peroxide works by killing acne-causing bacteria. However, it often causes irritation and dryness in people with sensitive skin. Salicylic acid helps remove the debris that clogs pores while destroying the bacteria that causes acne. It also helps improve collagen production and skin thickness. Some ingredients make skin oilier and cause acne breakouts to flare up. Avoid them when possible. Fatty acids: This ingredient family can clog pores and lead to cysts. Avoid butyl stearate, decyl oleate and dioctyl sodium sulfosuccinate. Lanolins: This family of ingredients causes acne irritability. Steer clear of acetylated lanolin, cetyl acetate, ethoxylated lanolin and PEG 16 lanolin. Botanicals: Botanicals sound healthy, but they are not the best choice for people who have acne skin problems. Read your ingredient list to see if any of these botanical ingredients are listed. Look in particular for carrageenan and red algae. While acne is most often associated with teenagers, many adults suffer from this embarrassing condition. In fact, adults typically have a more difficult time treating their acne because they are more likely to have skin that is easily irritated by the harsh ingredients in some acne skin care products. Contrary to popular belief, chocolate, pizza, French fries, and ice cream do not cause acne. However, eating a well-balanced diet rich in lean protein, whole grains, and fresh produce may help improve the look of your skin by reducing sebum production, enhancing tissue growth, and improving circulation. While a tan may temporarily minimize the appearance of acne, the sun does not cure acne. Sun exposure ultimately does more harm than good by leading to wrinkles and premature aging. In addition, some acne medications can make you more likely to sunburn in a short period of time. Although acne is an embarrassing problem, help is within reach. Your skin isn't going to heal overnight, but you can restore it. Keep oily skin as clean as possible without overdrying and treat your acne with patience and care. If home treatments aren't effective, visit a dermatologist for further evaluation. Stay positive; with appropriate skin care and treatment, healthy, clear skin can be yours.